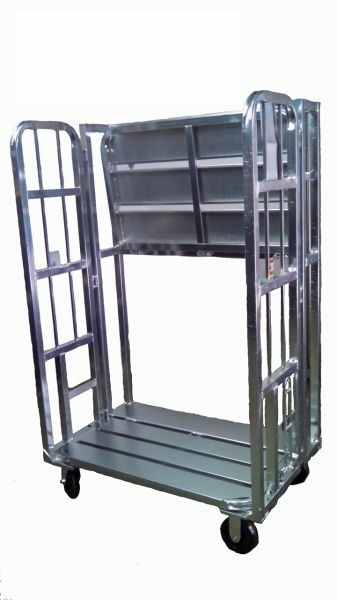 This zinc plated, heavy duty cart speeds product transportation and handling. Manufactured from 1 1/2" square tube & heavy duty C- channel with a load capacity of 3000 pounds.Folds down to a depth of 10" this cart can be securely stored in racks or L-frame configurations when not in use, freeing up valuable floor space. 2-6" swivel casters 2-6" rigid casters allow for easy maneuverability. Also comes with a tow hitch and coupler for moving multiple units.These carts work great in the dairy, manufacturing, retail, snack food and many other industries.